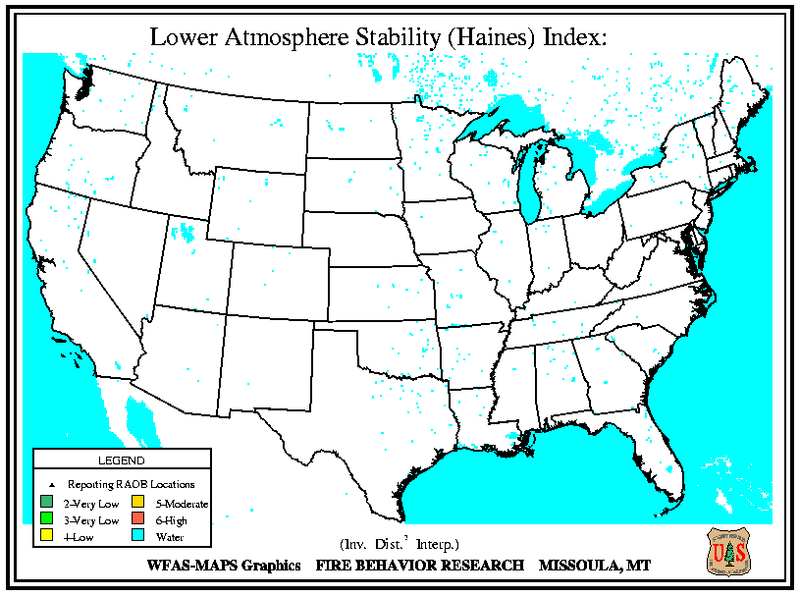 Haines (1988) developed the Lower Atmosphere Stability Index, or Haines Index, for fire weather use. It is used to indicate the potential for wildfire growth by measuring the stability and dryness of the air over a fire. It is calculated by combining the stability and moisture content of the lower atmosphere into a number that correlates well with large fire growth. The stability term is determined by the temperature difference between two atmospheric layers; the moisture term is determined by the temperature and dew point difference. This index has been shown to be correlated with large fire growth on initiating and existing fires where surface winds do not dominate fire behavior. Haines Index is computed from the morning (12Z) soundings from RAOB stations across North America. The Haines Index can range between 2 and 6. The drier and more unstable the lower atmosphere is, the higher the index.